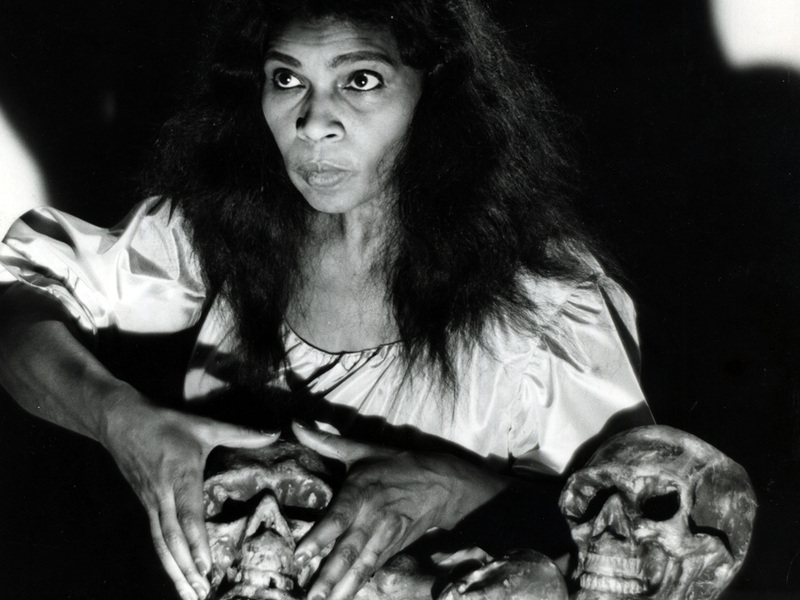 Contralto Marian Anderson in the role of Ulrica from a Metropolitan Opera production of Verdi’s Un ballo en maschera in 1955. In our prior pop-up paranormal investigation outside the perimeter of BAM we sought the spirit of Marian Anderson. Instead, our psychic found a spectral construction worker who dismissed us from the property. Put-off in more than a paranormal way – we considered calling it quits, but a few months later we received an invitation that would see us deep inside the worn doors of BAM Harvey Theater. As a team of paranormal investigators, we’re aware that we must keep an open mind and a willingness to experiment. When intriguing new opportunities arise, we embrace them. 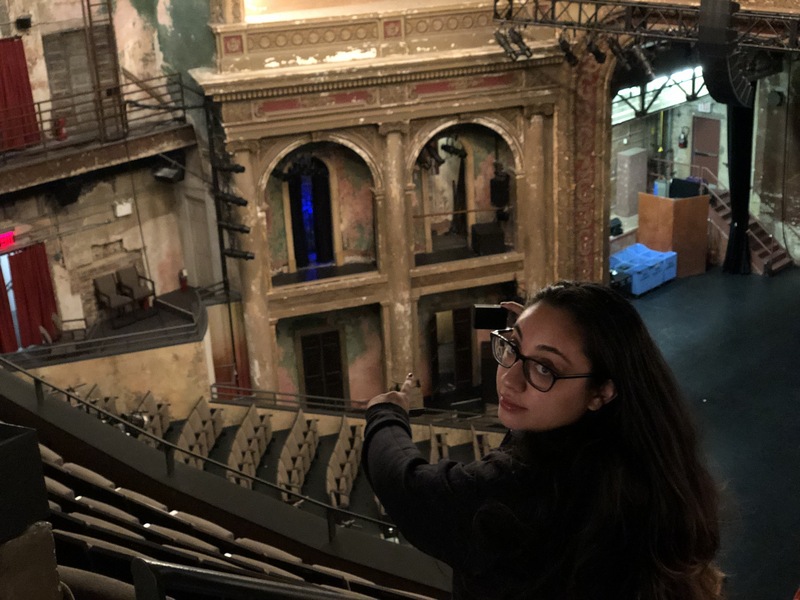 For the uninitiated, the Harvey is a historic 1904 theater which once hosted avant-garde performances and classical music all the same, drawing a diverse audience made up of Brooklyn’s artistic community and intelligentsia. The theater, at 651 Fulton St., was renovated (and renamed) in the 1980s, when renowned executive producer Harvey Lichtenstein hand-selected it as the venue for a nine-hour theater production. The original essence of the building remains, almost ruinous in its aesthetic; the crumbling brick and peeling paint stands at odds to the timeless theater-in-the-round seating area. This juxtaposition of past and present made the Harvey the obvious venue for a recent modern re-telling of the Henry James classic horror novella, The Turn of the Screw. In Victorian days, ghosts were all the rage. The premise of the 1898 novel is a classic Victorian ghost story from the Arthur Conan Doyle era, playing on the public’s fears at the time relating to death, mortality, and the beyond. The heroine is a governess of a vast estate, convinced that the home is haunted. The 1961 film The Innocents revisited the concept for the post-war epoch, but Strange Window: The Turn of the Screw by The Builders Association is a devoutly modern retelling for a millennial audience, with its use of technological stagecraft to create the ghastly and macabre atmosphere that fans of the original novella will be familiar with. In the original story, the governess was hired after one quick interview. Even as she senses spirits on the property, she vacillates between sharp certainty and disquieting doubt. At many points she feared she was going insane. Jade Rain Vega, BKPS Psychic points toward the location spiritual energy is felt. Jade, our psychic medium, is a female spiritualist who entered the scene with similar reservations about exploring the grounds. Recall that she sensed the spirit of a construction worker at the Brooklyn Academy of Music when we last visited. During our investigation, Jade and a coven member identified two areas of importance. Jade identified a spirit to stage-right, while our guest psychic identified spiritual energy to the stage-left. Before we could choose a path, we were informed that a crawl-space existed underneath us. The 4′ high space was described as creepy and claustrophobic. Naturally we decided to make a bee-line to see it. 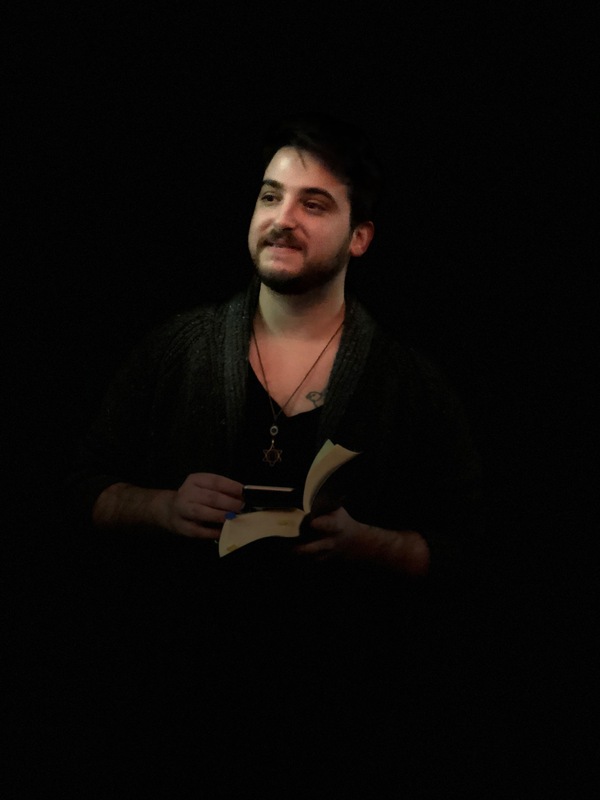 Opening with Psalm 91, also known as an “anti-demonic” psalm – Alex our resident tarot expert led an engaging prayer and asked for protection from spirits for the group. We open each investigation with a prayer, or ritual such as the Lesser Banishing Ritual. Psalm 91 is a poem, composed by either Moses or David, that imparts a confidence in the safety provided by God to the reader. Some consider Psalm 91 to be a Messianic prophecy, particularly upon reading its second half. Upon investigation of stage-left we discovered the ghost light. A ghost light is an electric light, usually near the stage that’s left on when the theater is unoccupied. While the ghost light was a source of energy, we did not find any spiritual energy attached to it. After checking out the ghost light, the coven made their way for an impromptu visit to the stage-left balcony. Here we encountered an energized exchange with a possible spirit who intelligently responded to our questions. For our final investigative stop, we ascended toward a spiral staircase to the stage-right balcony. Jade led the team like a psychic bloodhound to the location where she felt the spiritual energy was most dense. In our wrap-up, I imagine we looked a bit odd and out of place but the Archives Manager Louie Fleck was altogether too pleased to share a bit of fun facts about the theater with us. Louie also provided us with a truly immersive “behind the curtain” experience. He gave a riveting presentation that covered everything from the history of the theater to some of the most famous shows that have taken place on its majestic stage. We are grateful for the opportunity to investigate the Harvey, which was coordinated by Vilina Phan of BAM. Vilina was well educated and astute in pointing our similarities between the characters, and our BKPS Detectives. We look back now on the investigation, with some time having passed with slight discomfort. Perhaps some similarities between ourselves and the characters is too difficult to ignore. Will our debut in paranormal performance art haunt us forever? Detectives of the Brooklyn Paranormal Society pose for a photograph after our investigation of BAM Harvey Theater. Photo by Anthony Long 2018. When BKPS received a tip from a member that a church right here in our own backyard of Fort Greene was exhibiting signs of paranormal activity, I wasn’t sure what to expect. Passing twice daily when commuting, I often note a large “refugees welcome” sign. It’s always stood out to me, particularly in comparison to the other churches on the same stroll, which are authoritative and more traditional in appearance. Acting on a tip, I set out from Bed Stuy on a brisk night; the temperature ebbing around the freezing mark. Each step against the wind pained me, as my thoughts slowed to a crawl inline with my pace. Inching toward the church, I pondered my chances of finding evidence: Not high. Considering never before had I any inkling of this holy site hosting paranormal peeps, tonight probably wouldn’t be the night. My source duteously informed me of unusual activity that could be paranormal. The report included extreme temperature fluctuations in the general vicinity of the “church sign”, and a sorrowful presence that affected the self-professed empathic reporter greatly. Being midway through December, this tip that the sidewalk near the church was “physically a bit warmer” than other areas seemed especially curious. When investigating other instances* similar in nature, I found reasonable sources for abnormal events. * Some ghost hunters say a cold spot is an area of localized coldness, or a sudden drop in ambient temperature. On investigations, they’ll use digital thermometers or heat sensing devices to measure temperature changes to record data. Finding a cold spot seemed unlikely in the frigid temperatures, with my face unable to register temperatures below 40. After researching, I found a source which indicated “hot hot-spots” were significantly rarer than their cooler counterparts. Numb to the cold, I stood firm documenting the temperatures of the concrete and church signage, hoping to hit the jackpot; an unexplainable warm-to-the-touch spot. Turns out, Lafayette Avenue Presbyterian Church (located in Fort Greene) has a rich and fascinating history. Founded in the 1850s by abolitionists, today the church’s pastor, Rev. David F. Telfort, continues to dedicate much of his time to issues relating to social justice. The church is known to be a safe and welcoming space for immigrants, refugees, and minorities. As I investigated the church and its surroundings, I maintained a reasonable level of skepticism. I will say with confidence that I personally didn’t encounter any unusual patches of warmth on the sidewalk or anywhere near the church. However, the morbid sense of longing and sadness did make itself known to me. I don’t consider myself an overly intuitive person and have never claimed to possess any particular psychic abilities, but my work with Brooklyn Paranormal Society has enabled me to make use of some exciting and innovative new technologies that lift the veil to the other side, in a sense, and expose some of the mysterious happenings we might otherwise fail to notice. As I gazed upon the architecture, my attention was diverted to my iPhone. The ghost hunting app M2 Ghost Hunter, revealed in rather uncharacteristic rapid succession – three words; supposed communications from the spirits. At first glance, this appeared to be a bleak and somewhat disturbing message. Recall the significance of the location. Do your best to visualize Lafayette Avenue Presbyterian in the mid-1800s, its congregation joining together in worship, its abolitionist theology wildly subversive. It’s plausible that tremendous despair and sorrow followed many of the members of this congregation from their former homes. Such a place could certainly be a conduit for mournful spirits, perhaps those left in a liminal state, unable to safely cross over after an unjust or violent death. Then again, this church was also a place of freedom. It served as a safe haven for human beings deemed by the law to be unworthy of basic rights. It opened its doors to the oppressed, offered them a second chance, allowed them to join in the spirit of redemption. This 1853 painting, Winter Scene in Brooklyn, by Louisa Ann Coleman, depicts Brooklyn, just east of Fulton Ferry, as it was in the mid-1820s. In 1860, Vandergaw was at the junction of Fulton Street and DeKalb Avenue, probably where the Dime Savings Bank stands today. People of all races broke bread together right here in Fort Greene. Doesn’t it seem just as likely that immense peace and healing also took place on this very spot? Perhaps the spirits left lingering were not trying to communicate their anger or sorrow through the M2, but their joyful liberation. The contemporary meaning is less sinister than the original, which refers specifically to a collective psychic entity with the power to influence thoughts. Mind control conspiracies aside, I believe that both definitions could apply in this case. Possibly, the souls of these parishioners are still crying out for change, attempting to reach the hearts of people still living in Fort Greene. The simple three words conveyed to me through the M2 could be viewed in either a negative or positive light. It all depends on how one chooses to interpret the message. Anthony Long is the Chief Ectoplasm Officer for the Brooklyn Paranormal Society. Is The Gowanus Canal Haunted? Over many hundred years, the Gowanus Canal has hosted incidents ranging from Revolutionary War ambushes, to bodies being dumped gangland style. The busy cargo hub is now recognized as one of the most polluted bodies of water in the US, and allegedly hosts numerous spirits. Brooklyn Paranormal Society members have studied The Revolutionary War extensively as a pre-requisite for our investigations. Our previous visits have been met with some of the must unusual spiritual, and physical activity the group has ever encountered. Incredible odor, may be spectral.